Larson Electronics has added to its extensive range of industrial grade lighting equipment with the release of a 2000 watt hazardous area portable light tower with a manual crank up winch for operation. The wheeled quadpod mounted hazardous location light tower is U.L. approved Class 1 Division 2 and is rated for use in wet environments. The HAL-C-2X1000W hazardous location metal halide light tower from Larson Electronics is comprised of a removable dual light head assembly mounted atop an adjustable quadpod light tower fabricated from non-sparking aluminum. The two 1000 watt hazardous area metal halide lamps are mounted on a two wheeled adjustable quadpod tower that gives operators an easily deployable source of powerful light that can be quickly setup and adjusted to effectively illuminate hazardous work areas. This unit’s durability, easy deployment, high power and the good color rendering of its metal halide lamps make it ideal for close work and hazardous areas where safety, detail and accuracy are critical. This unit contains two 1000 watt metal halide lamps that are capable of illuminating 85,000 square feet of work space. The metal halide lamps have no filament and are thus highly resistant to damage from shocks or impacts; greatly reducing the chances of damage should the tower be knocked over, unlike incandescent lamps which may break or shatter. The lamp housings are waterproof, making this unit ideal for use in wet and marine environments. The non-sparking, adjustable and collapsible tripod can be extended to twelve feet and collapsed to seven feet by an included hand winch, while wheels mounted to the bottom of the tower enable the operator to tilt the unit back and simply roll the entire assembly to a new location. The bracket that holds the explosion proof fixtures can be removed by releasing the hand knob and sliding the lights and mounting bracket off of the tower support while the legs can be collapsed, aiding in deployment, storage and transport. 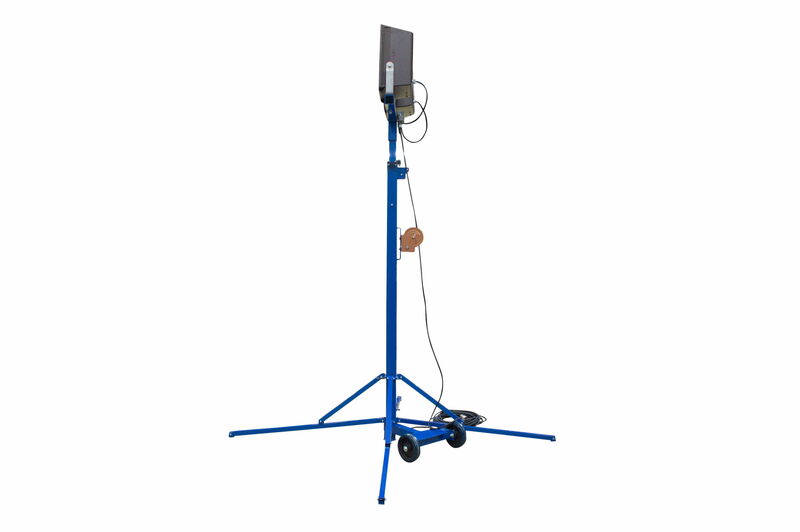 Larson Electronics carries an extensive line of light towers, portable distribution panels, explosion proof lights, portable work lights and industrial grade LED area light. You can view Larson Electronics’ entire line of lighting by visiting them on the web at larsonelectronics.com. You can also call 1-800-369-6671 to learn more or call 1-214-616-6180 for international inquiries.